There is something quite surreal and mysterious about people who used to live in caves and places carved out of rocks back in the day. I've always been fascinated by them especially after seeing caves while traveling to Petra in Jordan. 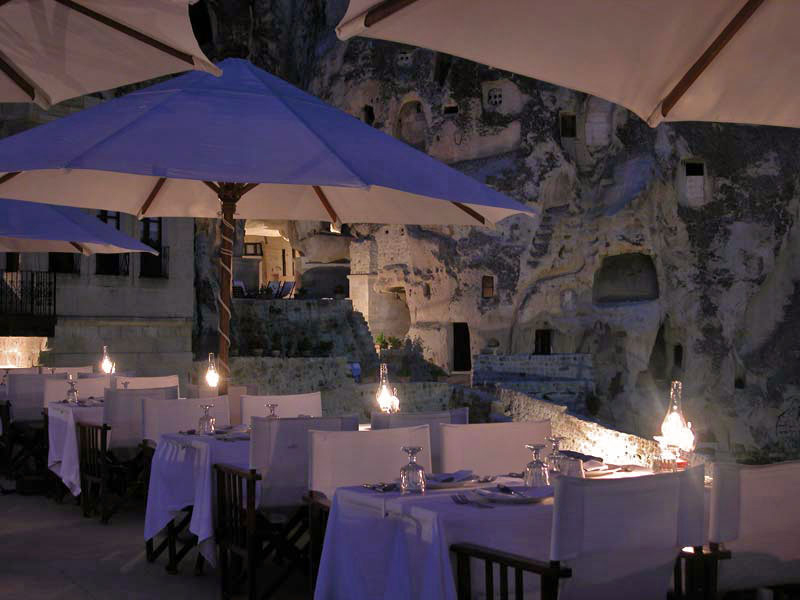 Three cheers for the Yunak Evleri Cave Hotel in Turkey, so quirky and interesting, this is going into my travel files. Would you stay here? I really admire your blog but as a reader from Greece, I can assure you that Petra is in Jordan and most surely not in Greece. wherever this is, it is amazing! i would love to stay there. and think she was just referencing petra because of the caves, not because of the location. This hotel is definitely in Turkey and it is in a very beautiful part of Turkey. I just wonder how you came up with the idea of being this place in Greece? Thanks Anonymous -- I meant Petra since I've seen caves there, I have clarified it now and on the other note, I believe I was looking at something relating to Greece earlier today that may have caused the error. Thanks for the corrections everyone, I appreciate it. It is updated now. amazing! i would stay there in a heartbeat. Breathtaking! I would love to stay there. I would also like to visit the Anasazi Cliff Palace in Colorado, I've heard that it is really neat! I love the first photo! I could just look at it all day. So fascinating! I was just in Cappadocia a few months ago, and stayed somewhere similar. The whole area is super cool, with lots of beautiful walks to take, and entire underground cities to explore. It actually looks just like southern Utah, but with a lot more cave houses. In fact, people still live in the caves, and if you go walking around the villages and valleys there you'll see satellite dishes poking out of the stone houses, and curtains in windows and stuff. I was amazed to find that people still live in caves! So cool! its ayse from turkey : ) an this lovely hotel is in turkey too. i can also recommend another hotel which I stayed 4 months ago. you should definetly come to turkey ! I don't really know if this could be any cooler. Oh I would definitely stay there. In a heartbeat. I'd like to jet off there right now, frankly. SO COOL! Yes, I would definitely stay there....just as long as the beds aren't made of stone too. Haha. I absolutely would stay in the caves. I studied byzantine history and have been fascinated with the idea ever since. It's on my bucket list! i need to travel more...this is just giving me the bug! no matter where it is, it seems amazing. I REALLY WANT TO GO HERE!!!! i've been to cappadocia and seen these caves, but had no idea you could stay in them - this makes me want to go back! wow, these pictures are breathtaking! i want to go! I would try it, the place looks quite magical and it must be a unique experience! Turkey is number one on my travel list. Just another wonderful reason to go! Thank you! I would love to stay there! What a unique place! WOW..makes me want to leave tonight! Thanks for your beautiful blog, I found it on "you are the river". very cool. i recently watched an episode of "an idiot abroad" and karl goes to petra and stays in a cave. he really loved it. :) this hotel i'm sure this hotel would be fantastic! I stayed here back in 2006, and it is every bit as cool as it looks! It was very comfortable, except for the low doorway to the bathroom that I hit my head on repeatedly... ouch. really impressive wherever it is! i've been there. great ambient. great nature. great wine and everything. and it is really cheap compare to europe because of currency. 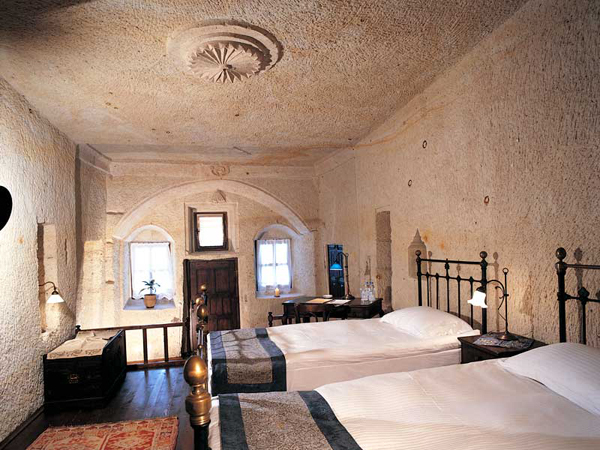 I stayed in a similar hotel in Cappadokia, in central Turkey- it's amazing! the rock is a soft, porous rock called Tuft, and is easy to carve out. So amazing!! 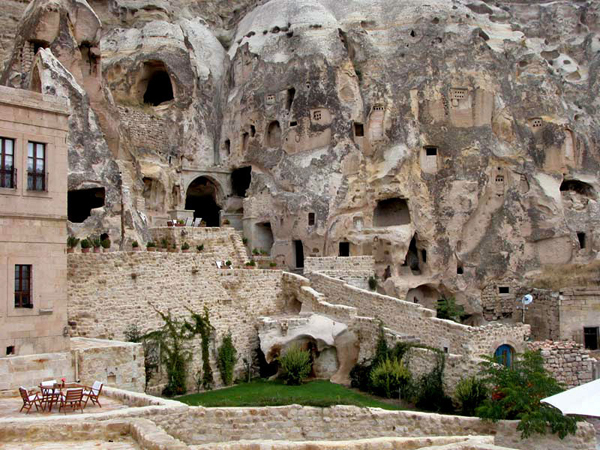 this is somewhere around göreme in kappadokya, it's also known as the heart of turkey! i was there in november, pretty amazing! thousands of years ago people built these caves with their hands. it's tuff stone. a trip to turkey is definetely worth it! I m fr Turkey and I have stayed in this hotel in one of the caveroom. I was thinking of posting in my blog here i saw your post.It is definetly a good idea and veryyyy inspiring for travelrs and people looking for something unusual! The hotel is recomended strongly very good hosting as well.